One of the greatest features of BoldGrid is the ability to create a separate staging site. This is perfect for you to set up your site's next phase or version without affecting the current live site that visitors see. Once you have completed the staging site and want to make it live, you will need to deploy the staging site. 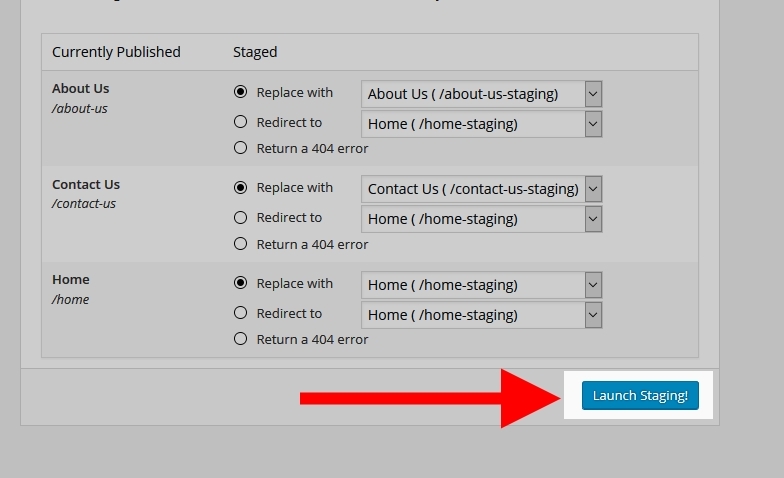 This will switch your live and staging sites, so that your Staging site is now the Active site and the previously active site is now your staging site. From there you can remove the old site and begin again. Log into your BoldGrid admin dashboard. 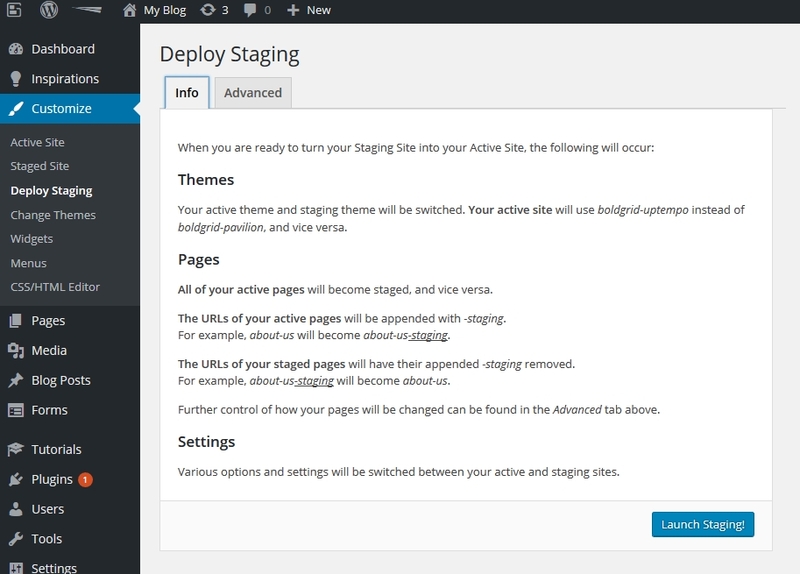 Hover over the Customize option in the left hand sidebar menu and click on the Deploy Staging option. Read the Info tab so you understand what will happen when you deploy. The Advanced tab offers a couple of options you may wish to consider. For any pages that will be replaced, leaving the default settings should be fine. For pages that will have no replacement, you may wish to select a redirect option. Once you have everything set to your liking, click on the Launch Staging button. 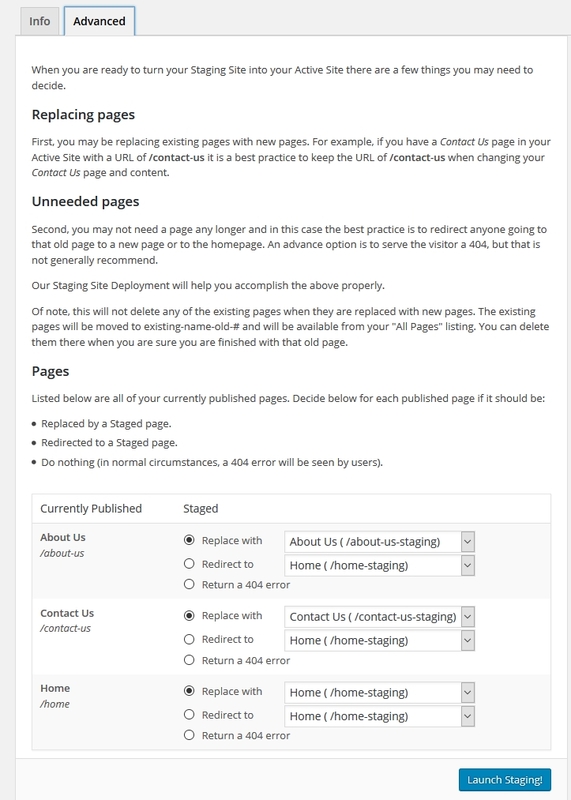 The staging and active sites will swap places, deploying your staging site. You should see a page saying the deployment was successful. Here is an example of the results of deploying the staging version of your site. The left site image is the original active page and the right is the site after deploying the staging version. Please answer the follwing questions to help us improve this article. Is the information out of date or inaccurate? Are there spelling or grammatical errors? Are there broken links on the page? One being hard and ten being easy. How easy were the instructions to follow? How easy was it to find the guide you were looking for? Ooops! It looks like there are no questions about this page. Would you like to ask a question about this page? If so, click the button below! I've read the reply and the steps, as well as the article linked ("BoldGrid Staging with an existing site") but the basics of all this are not clear at all. 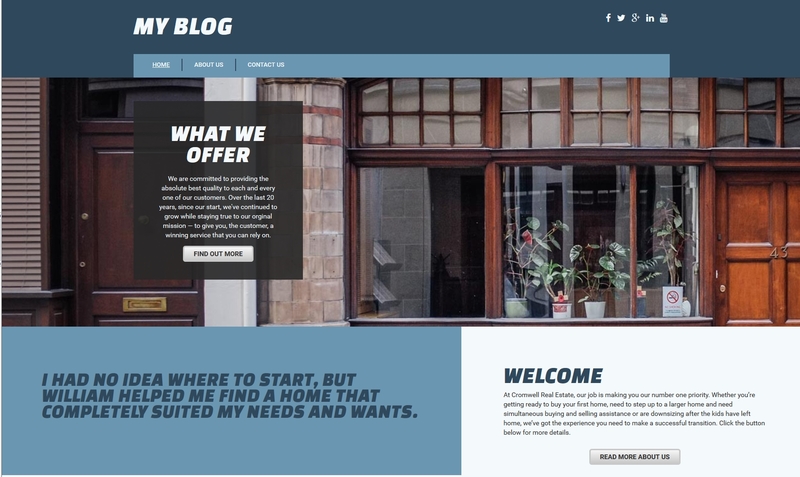 I'm hosting with InMotion and have a WordPress site built using the X Theme. I don't have BoldGrid installed as I had different needs that the X Theme was a better match for. Can I have (and keep) a different theme, use ONLY the staging functionality of BoldGrid and continue using my existing theme, customizations, etc. while staging with BoldGrid? BoldGrid is optimized for the official BoldGrid themes. For that reason it's not recommended to mix in third-party themes. You can certainly try, but there's a higher probability of conflict. We can only stage a site using Boldgrid? 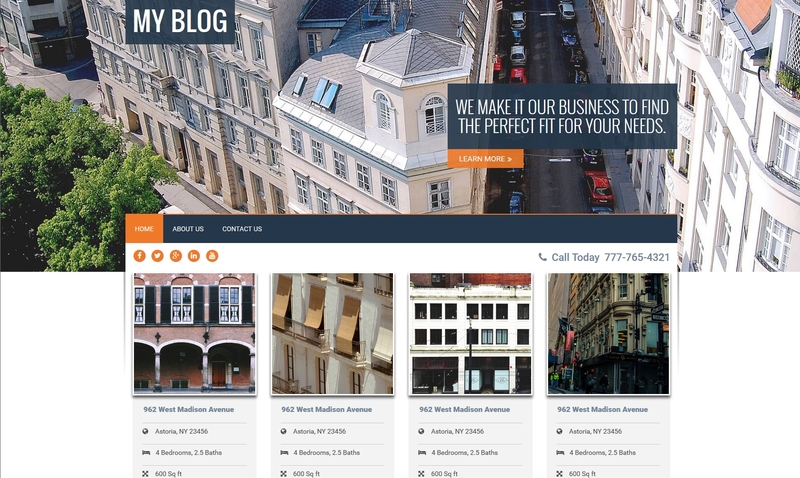 I have a wordpress site using the AVADA theme. Would be possible to me to make a staging site? Thank you. You have options here. 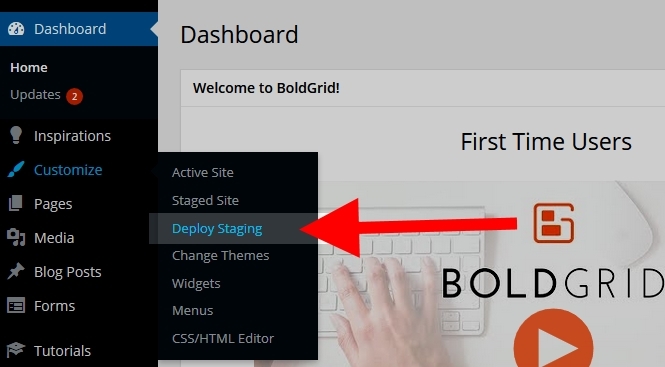 You can check our guide for using BoldGrid Staging with an existing site or check out other WordPress staging plugins to accomplish this. Please note: Your name and comment will be displayed, but we will not show your email address.